Basement Hall of the Theosophical Society in Stuttgart, Germany. Dedicated by Steiner, 1911. Tinted photograph. The hall was destroyed in World War II, but the seven seals are preserved in Dornach and the columns are in the gardens of the Husemann clinic in Wiesneck. 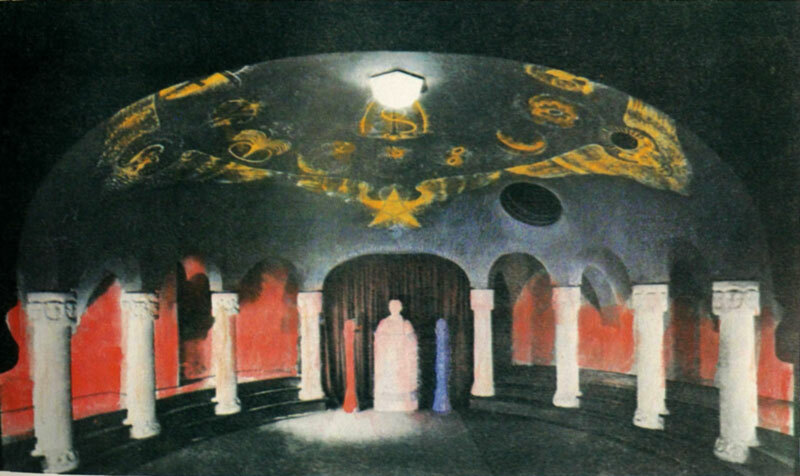 "Rudolf Steiner was able to give his esoteric classes in this hall of columns...Many of the members and those attending lectures or the Mystery Dramas in the lecture room and theatre in the upper part of the building had no knowledge of that hall in the basement or of what went on there." (p. 24).